56 HENRY is please to present Caput Mortuum, an exhibition of recent work by New York-based artist Joanne Greenbaum. Comprising an installation of small sculptures that Greenbaum produced for the last ten years, the show will be on view from March 28th through May 20th, 2018. Caput Mortuum marks Greenbaum’s first exhibition with 56 HENRY. Made with fired clay, sculpey, cellulose, and air drying clay, the installation is a collection the artist makes alongside larger sculptures and paintings in her studio. Though the works that comprise the installation were never intended for exhibition, taken together, they form a kind of archive and lexicon that records Greenbaum’s many experiments with form and color. 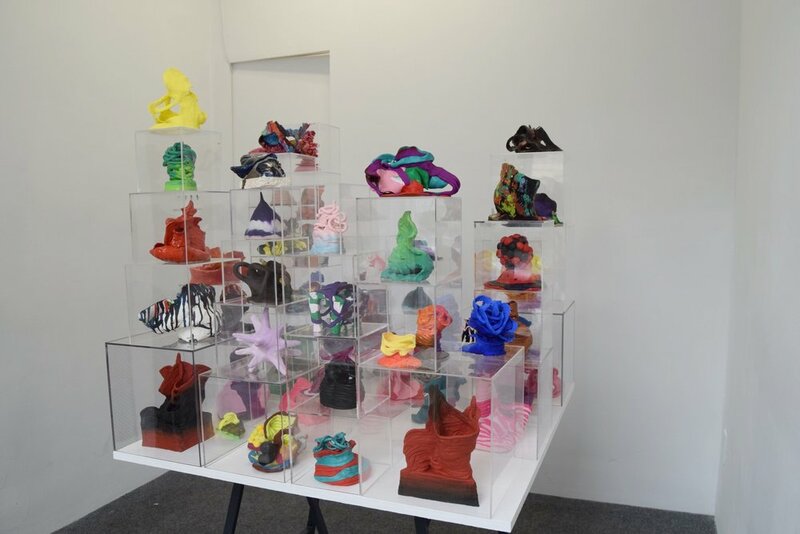 Assembled here, the works take on new meaning, as they are isolated in plexiglas boxes to create an environment specifically made for the gallery space. The exhibition’s title, Caput Mortuum, is a Latin phrase that means “worthless remains” – used here, the phrase highlights the nature of the exhibition as a collection of three-dimensional relics from the studio. Caput Mortuum also refers to the name of a purplish/brown pigment. Joanne Greenbaum lives and works in New York City. She received her B.A. from Bard College. Her work has been featured in numerous solo and group presentational internationally and in the United States. Greenbaum’s current solo exhibition at the SMFA Tufts in Boston, titled Things We Said Today, will travel to the Ben Maltz Gallery at Otis Art Institute in Los Angles in May of this year. In New York, Greenbaum is represented by Rachel Uffner Gallery. Exhibitions at 56 HENRY are visible 24 Hours a day. Gallery doors are open to the public Wednesday through Sunday, 12:00 - 6:00 pm. For more information or images related to the exhibition, please contact Ellie Rines at (518) 966-2622 or info@56henry.nyc.